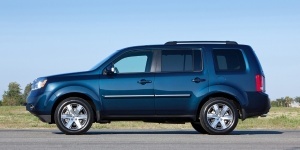 The Honda Pilot adds more equipment for 2015. Standard on all models is remote keyless entry, a rear-view camera and an integrated Class III trailer hitch, while a Special Edition (SE) trim adds sporty pewter gray aluminum alloy wheels, special SE badging, a tilting power sunroof, Sirius XM satellite radio and DVD rear entertainment system to the EX's equipment. Find the used Honda Pilot of your choice from a dealer in your area. Search our used car listings now.